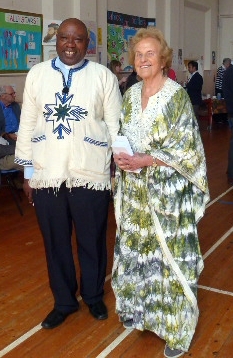 Dr Mary Groves led worship with the theme World Church Celebration on 12 May. The focus was on Nixon Memorial Hospital, Segbwema, Sierra Leone. The Rev. Francis Nabieu preached on the inclusivity of the Christian way of life and our interdependence. He made a strong appeal for support and prayer for the people of Sierra Leone, particularly those in remote communities such as those residing in villages around Segbwema. 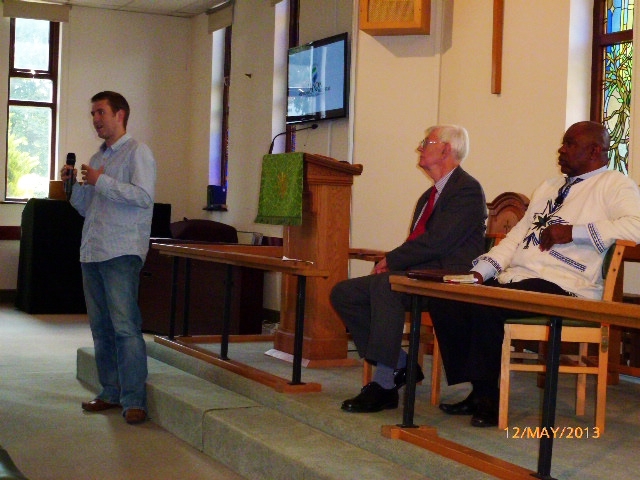 It was a lively and well attended service. After refreshments in the church hall many in the congregation returned to the church to hear more about the situation in the villages in the Eastern Province of Sierra Leone. In a Question and Answer session led by Rev. Colin Rowe. Rev. Nabieu emphasised graphically the real hardship and almost inconceivable poverty of the area where stark choices were made daily between having enough food to eat, enough money to send a child to school or not. There was little money to provide transport to a hospital or to buy medicine and as a result very many lives were lost. Life expectancy in Sierra Leone was very much lower than in the UK. Dr Robert Burnie also spoke vividly about his experience while a trainee doctor at the hospital and what Friends of Nixon were doing to in support of rebuilding health services in the area. After this a buffet lunch was served, this was well co-ordinated and with a delicious array of dishes for all to enjoy. Donation envelopes were distributed and once the total is known it will be announced on the site. The day was well organised and Friend of Nixon are very grateful to the church and its members who made such an effort towards its success. If your church or group would like to arrange for a speaker or help in organising an event please do not hesitate to contact us. As a very small charity only in our second year we have managed to raise in excess of £30,000 towards work at the hospital through the generosity of individuals and some organised activities. Our funds are being used to build community latrines and water wells and train village people how to maintain and use these structures. They are taught about the importance of clean water and avoiding water borne diseases which are prevalent in local streams and open ponds and preventing disease spreading by using latrines instead of the open air. We have sponsored hospital staff on training courses to increase their skills and provided teaching aids and laboratory equipment and supplies. There is still a long way to go and much more money is needed but we are funding the hospital directly. Our money does not go through any intermediary. We have people on the ground and some of our trustees visit (at their own expense) to keep us updated and verify our funds are being used effectively and honestly. All of our trustees are volunteers and offer their time and resources. Francis Nabiue, at the end of his talk, extended an invitation to anyone to visit Sierra Leone and enjoy some of the best beaches in Africa and then travel east to see for themselves the work being progressed at Nixon Memorial Hospital. You would certainly receive a warm welcome in this land where people have big hearts and a welcome for all!